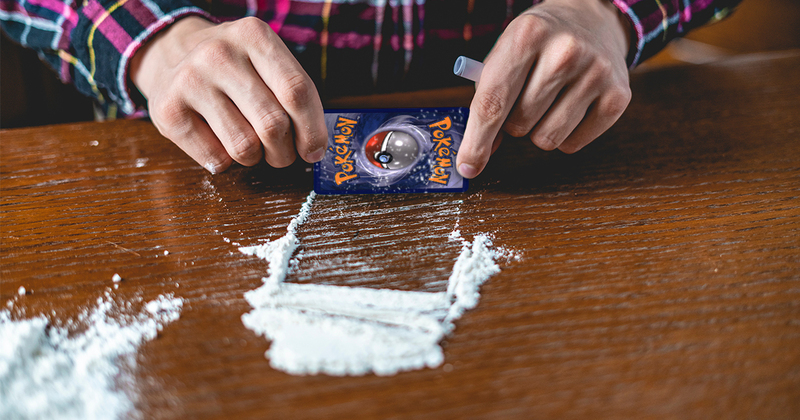 HARTFORD, Conn. — Local resident Shane Dyson is reported to be expressing his devotion to the realest decade of all, the 1990s, by using his “mint condish” Pokémon cards to chop up the cocaine he offers to guests in the back room of whatever house party they let him into. Fellow party guest Ryan Amos, 29, confirmed that Dyson used a special edition holographic Scyther as a reflective surface to make sure he didn’t waste product and rolled a clear Ultra PRO deck protector sleeve into one of those fun little coke straws. Amos is said to have lived through the 1990s at a formative age as well, though somehow without making a huge deal of it. Dyson was also seen hitting on various college sophomores by expressing his disbelief that they’ve never done molly and couldn’t find Pallet Town on a map. After being asked to leave the party, Dyson resolved to stumble home to his “partner,” later confirmed to be a bunch of Beanie Babies he stitched into one life-sized Beanie Baby to spoon. Subsequent witnesses at Dyson’s day job reported that he seemed pretty hungover, but bragged endlessly about pounding so much Surge and rum — a drink only a real ‘90s kids would remember — until it was a night only a real ‘90s kid would want to forget.